Alrighty folks, this picture does not do these babies justice. Before you skip this post and say meh, remember that I’m am a totally sleep-deprived mom to a 12-week-old hoodlum baby and I may or may not have used the correct settings on my camera when I took this. I found these silicone heart pans in the dollar aisle at Target last week. I grabbed two, having no idea what I’d do with them, and quickly found myself wondering if I could adapt my Lovers Cheesecake to these pans. It worked like a charm. Silicone is a perfect material for cheesecake — it can go from the oven to the freezer and releases the cheesecakes beautifully. 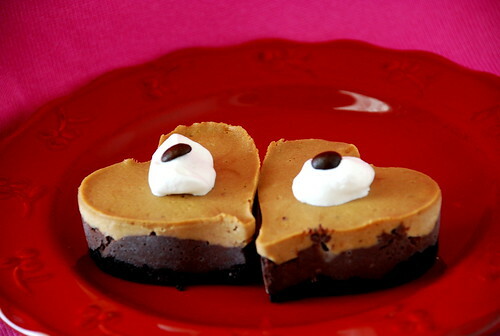 These are perfect for a Valentine’s day meal (or, if you’re me, a 4pm snack with a frothy cup ‘o joe). If you don't have the heart pan, you can use a muffin tin. Use a knife to loosen the edges of the cheesecake before releasing. And if the coffee taste is not your thing, omit the instant coffee granules. Garnish: Cinnamon, Chocolate syrup – Up to You…coffee beans maybe?? Beat cream cheese, sugar and vanilla until smooth. Add flour and stir until mixed. Add egg whites and stir until mixed. Measure out half (about 2/3 cup) of the cheesecake mixture and set aside. Add melted chocolate to remaining cheesecake mixture in bowl and stir until well-mixed. Spread chocolate mixture over crust. Combine reserved cheesecake mixture with the dissolved coffee and stir until well mixed. Spread evenly over chocolate layer. Set pan in a larger (square) pan and fill larger pan with warm water so that water comes halfway up sides of heart pan. Place on center rack of oven and bake for 22 minutes. Remove heart pan from water and let cool on a cooling rack to room temperature (about an hour). Place in freezer for at least another hour. When ready to serve, carefully turn pan upside down and unmold silicone by pushing gently on each heart (cheesecakes should come out very easily). Garnish each with a dollop of whipped cream and sprinkle with cinnamon or drizzle with chocolate syrup . Thank you for the fabulous recipe!!! I made these for my husband & I for Valentines and we both loved them!! !